The sun comes out and you start to sneeze – it’s hay fever time, when pollen gets into our airways and our immune system produces mucus, heat and itch. Avoid contact with pollen to reduce your allergic response – check the pollen forecast and close windows when the count is high. Use Weleda Skin Food around your nose to trap pollen and Weleda’s Rhinodoron Nasal Spray to ease congestion. Homeopathic remedies alium cepa, euphrasia and gelsemium are combined in Weleda’s Hayfever Relief Oral Spray. Go to your doctor if the symptoms are severe, new, or if you have increased asthma symptoms. Conventional medicines, such as steroid nasal sprays and antihistamines, are used to stop the body’s severe immune reaction. A good health food store will be able to offer you natural equivalents. Aim for good management of your symptoms, and the best treatments to stay comfortable until the season ends. 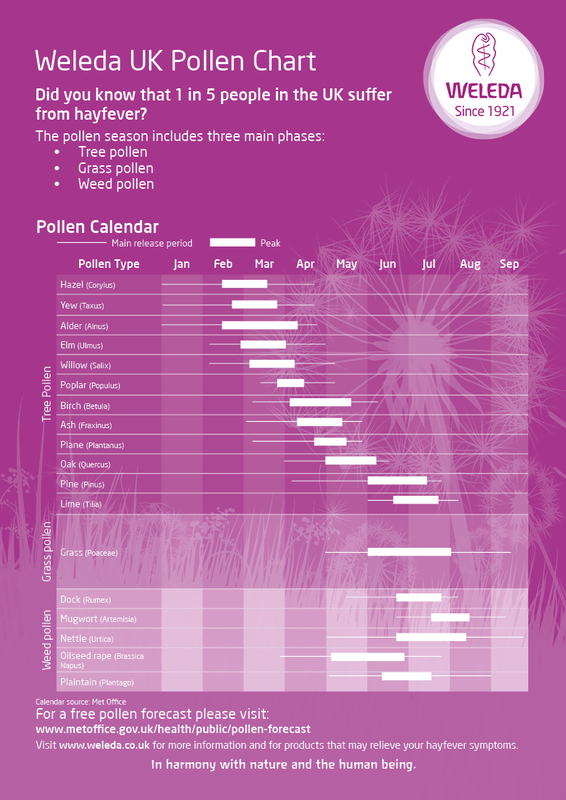 Visit the Met Office for a free pollen forecast and download a PDF version of our Pollen Chart to see what pollen is around in the warmer months.